CHERAS, 16 July 2012 – The National University of Malaysia Medical Centre (UKMMC) has been afforded the status of a psychiatric hospital under the Mental Health Act since July 15, 2010. Prof Dr Jaafar Md Zain when launching the UKMMC Safety and Health Week here last week on behalf of the Dean of the Faculty of Medicine and Director of UKMMC said the status gives it the authority to admit, detain, rehabilitate, control and take care of people with mental problems. Various activities including demonstrations on the correct use of fire-fighting equipment, an exhibition, training, a seminar and talks on staff safety and health were held during the week with the theme ‘A safe campus, healthy staff improves productivity’ . Other programmes organised include healthy lifestyle, aerobic exercises and power walk, medical checkups, cycling and a motorcycle convoy. Prof Jaafar said during the first six months of the year the Medical Centre recorded five road accidents and six other accidents at the centre including falls and aggressive behaviour by patients towards its staff. He described them as minor cases and showed the high level of awareness about safety in the work place among the staff. UKMMC in compliance with a move by the Ministry of Health has also set up a Patients Safety Committee and had already implemented 12 of the 15 ‘Goal Statement and Rationale’ in stages. 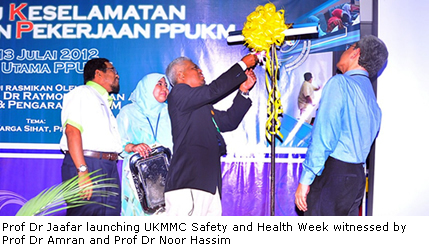 Head of the Health and Work Safety Unit of UKMMC, Prof Dr Noor Hassim Ismail said the week was also held in conjunction with the 40th anniversary celebrations of the setting up of the centre. Apart from sharing knowledge on health and safety, the week was held to encourage the centre’s staff, researchers, students and suppliers to work towards ensuring a safe and healthy environment at the work place. 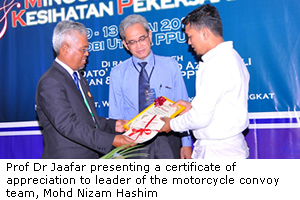 Director of the Office of Occupational Safety and Health UKM, Prof Dr Amran Abd Majid flagged off a convoy of 57 motor cycles from the Tun Abdul Razak Hall (Dectar) in the main campus in Bangi to UKMMC. The riders include UKMMC staff including Head of Security UKM, Lt Kol (B) Juri Tasripan and riders from the Sentral Eleganeers Club. 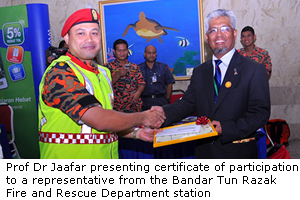 An exhibition on occupational health and safety was also held by various departments of the centre as well as several government agencies including the Fire and Rescue Department, the Social Security Organisation (Socso), the National Anti-drug Agency, PLUS and Safety Lab Sdn Bhd.